Advance Development and Manufacturing (ADAM) was incorporated in 1956. It was formed as a Job Machine Shop specializing in prototype and short run production of electro-mechanical assemblies. As of 1969 four of the original five founders and stockholders had retired from the company and the stock was redeemed by the corporation. Robert F. Fisher has been President of the Corporation since its inception and up until his retirement in 1992. Robert Fisher's youngest son, John Fisher has taken over as President and General Manager and continues to run the business today. ADAM's major products are the launching and arresting gear for the carrier fleet of the US Navy, heat exchangers with custom applications according to customer requirements, the manufacture of lacrosse goals, and the refitting and line boring of front-end loaders and buckets for the heavy equipment machinery. 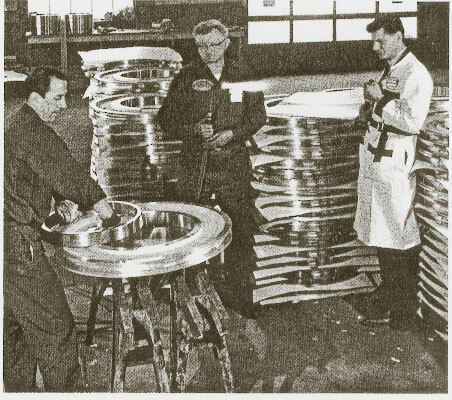 November 1965, a bearing is being installed on a machined aluminum sheave forging.